The Great Route of São Jorge covers approximately half of the Island, in a linear route that connects the parish of Topo, in the Eastern part of the Island, with the Fajã dos Cubres, on the North coast. It has an extension of approximately 41,5 km. 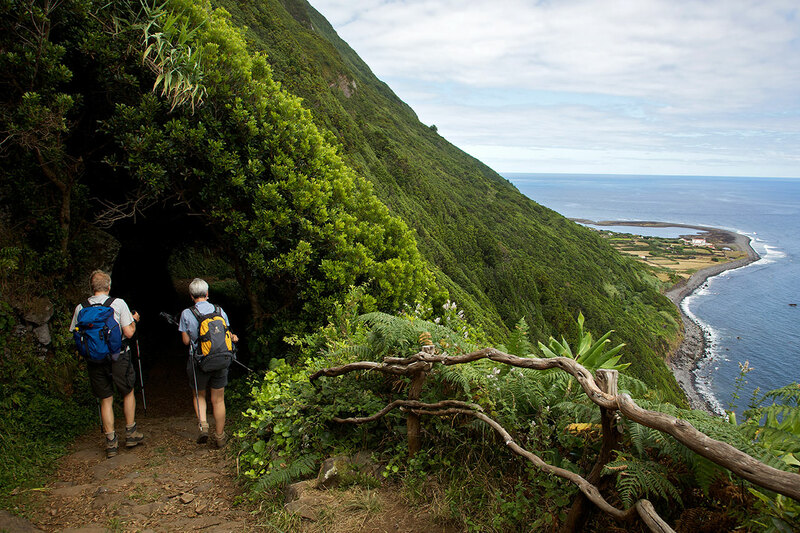 This circular route, on the North coast of the island, allow us to visit the Fajãs do Mero, Penedia and Pontas. This trail begins in the outskirts of the Parish Council of Norte Pequeno and from here continues inside the village towards the sea. Following the marks, you will find a dirt road on your left, where you should follow. In this road accessing agricultural fields, there are Azorean Heather (Erica azorica) and also an area of water collection for local consumption. San Jorge, 40 Km south of Graciosa, 20 km north of Pico, 60 km west of Terceira and 30 km east of Faial is central located in the archipelago. It is 56 Km long and 6 to 8 Km wide, with a total area of 246 km2. It's located at 28º 33' W and 38º 24' N.
The climate, as on the other islands is moderate, with average annual temperatures of 12º C (53º F) in the winter and 25º C (77º F) at summer. The trail initiates near the recreation port, bathing area where it is possible to dive into the Atlantic waters. Still inside Fajã, profit to visit the handicraft workshop where the traditional quilts are made and taste a coffee produced locally. This trail begins next to the Ermida de Santo António [St. Anthony’s Chapel] in Norte Grande. Start by going down the asphalt road for 400m and then turn left. 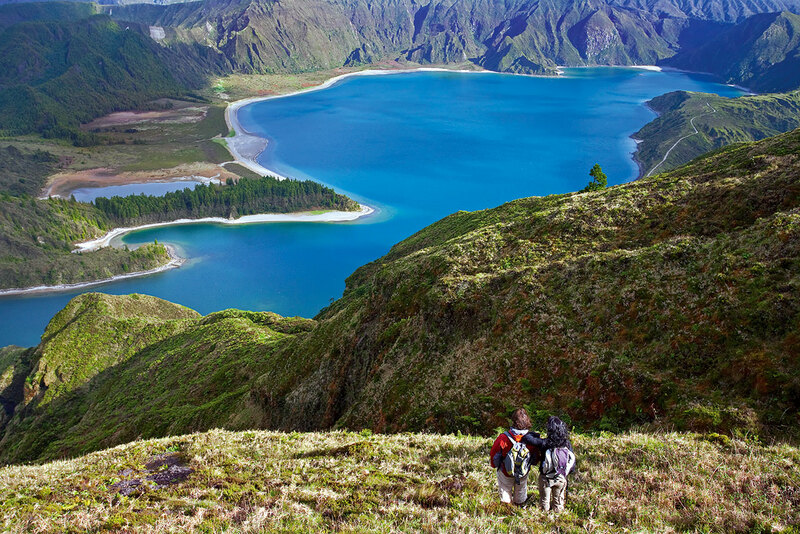 After about 700m you will reach a viewpoint with wooden railings overlooking Fajã do Além. From here on, take the stone stairway down to the houses of this fajã [strip of land by the sea]. Note that, while descending, you will see water running off from the rocks in several spots. On arrival at the fajã follow the markings past various houses. En route, visit Mr. Moisés’s mill if you wish. This linear route goes through the central area of the island along the mountain range. It starts at Pico do Pedro, passing by Pico da Esperança, highest point of the island with 1053 m and ends in Fajã do Ouvidor in the North coast. Begin the trail at the base of Pico do Pedro, near the road EN3, through a dirt road. Go around this Pico by the North slope and follow the marks until you find the arrow with the detour to Pico da Esperança. Until there, the walk surrounds several other peaks such as Carvão, Junça, Verde, Montoso and Morro Pelado. This route begins in Fajã dos Vimes by a quay and an old fountain. 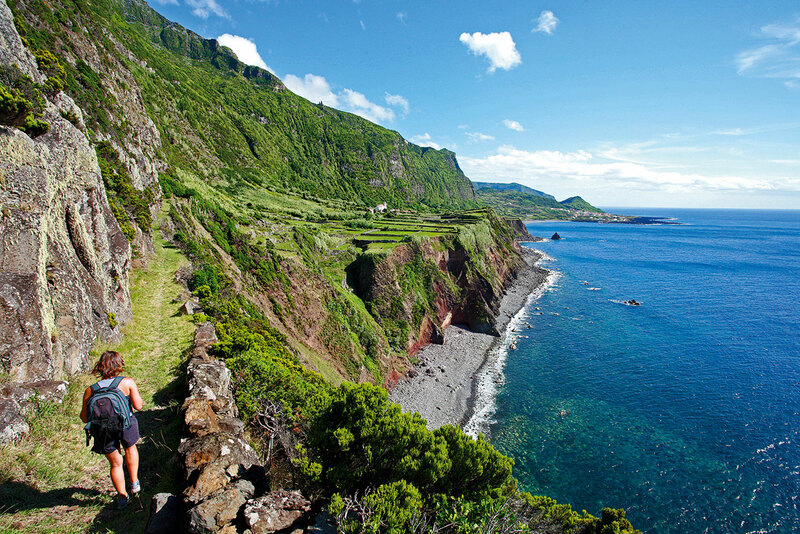 Start by walking the dirt trail to Fajã dos Bodes, passing by a watercourse. After walking by this fajã [strip of land by the sea], continue along the path, which climbs to Lourais amid Australian cheesewood (Pittosporum undulatum) and fire trees (Morella faya).